Voted #1 business book by Inc. 500 CEOs. An instant classic, this revised and updated edition of the phenomenal bestseller dispels the myths about starting your own business. Small business consultant and author Michael E. Gerber, with sharp insight gained from years of experience, points out how common assumptions, expectations, and even technical expertise can get in the way of running a successful business. Gerber walks you through the steps in the life of a business—from entrepreneurial infancy through adolescent growing pains to the mature entrepreneurial perspective: the guiding light of all businesses that succeed—and shows how to apply the lessons of franchising to any business, whether or not it is a franchise. Most importantly, Gerber draws the vital, often overlooked distinction between working on your business and working in your business. 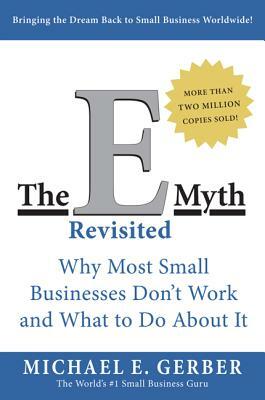 The E-Myth Revisited will help you grow your business in a productive, assured way.